Now open at The Dirty Grind is an exhibition by John Brianna (Johnannes1977 Resident) entitled The Mask Collection. While it may at first seem to be a modest collection of nine images, it is nevertheless a nuanced, eye-catching display, mixing the physical and the virtual which challenges us to consider what may or may not lie behind the mask we may wear at any given time. The images, seven of which can be found within the main room at Dirty Grind Theatre and the remaining two in the foyer area, feature studies of both avatars and people wearing a variety of masquerade and other masks. All have been marvellous finished is style suggesting they are either either painted or drawn, and such is the skill with which this has been achieved, I leave it to you to decide for yourselves which are taken from Second Life and which from the physical world. The idea that we all wear masks, whether in the virtual realm or the physical, is an old one, subject to many debates and discussions on the nature of self, identity and how we project ourselves in different circumstances. Within Second Life, such debates can often become far more philosophical, simply because we have a much greater freedom to project an appearance through an avatar, or to play a role within an environment without revealing much of ourselves beyond that role. Or equally, through the very act of “concealing” ourselves within an avatar /role, we can gain the security which allows us to project far more of our personality and nature among strangers and acquaintances than we would were we in the physical world. It’s an engrossing subject, but truth to tell, even without being drawn into such philosophical ruminations, this is a superb exhibition which should be seen to be appreciated. The images – as noted above, and which are offered for sale at L$400 each – are exquisitely produced; each one has a unique look and style, coupled with a very individual use of texture and colour, which makes it instantly captivating, drawing the visitor into it. The Mask Collection will remain at The Dirty Grind through until the end of September 2016 – not to be missed. NASA’s Juno spacecraft has continued to return data and images from its second pass around Jupiter on August 27th, 2016. Images in visible and infra-red light have been received as a part of the data – together with the sound of Jupiter’s “voice”. 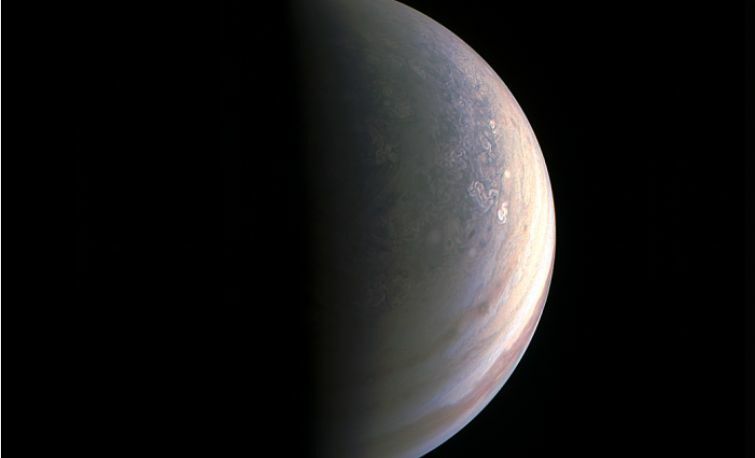 Of particular interest are the images of Jupiter’s north pole – which has never been seen by human eyes, and is revealed as being vastly different to the rest of the planet, together with detailed images of the planet’s south pole, only previously briefly seen by the Cassini mission in 2008, whilst en route to Saturn. 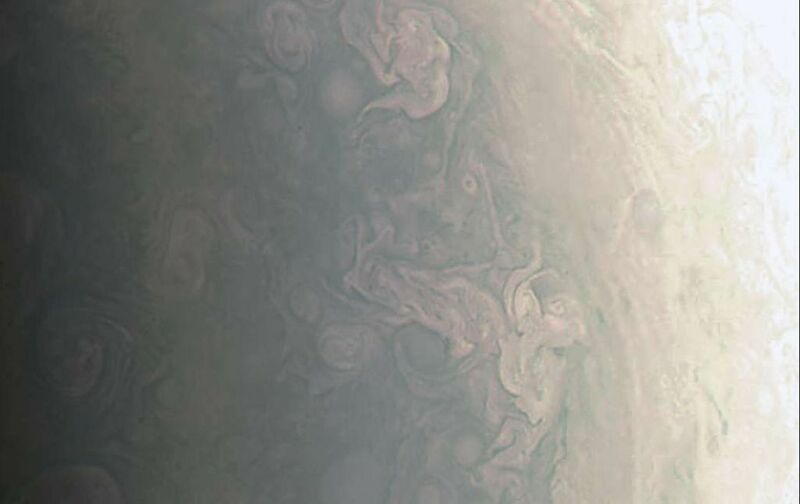 “First glimpse of Jupiter’s north pole, and it looks like nothing we have seen or imagined before,” said the Juno mission’s principal investigator Scott Bolton on the release of the most recently received images and data on Friday, September 2nd. All of Juno’s science instruments were active during the flyby,gathering some 6 Mb of data, images and sounds, which was transmitted back to Earth over a period of a day and a half once the space vehicle had moved away from Jupiter once more. Among this data were images from the Italian-built Jovian Infra-red Auroral Mapper (JIRAM), which returned the first ever close-up infra-red images of Jupiter’s massive aurora. 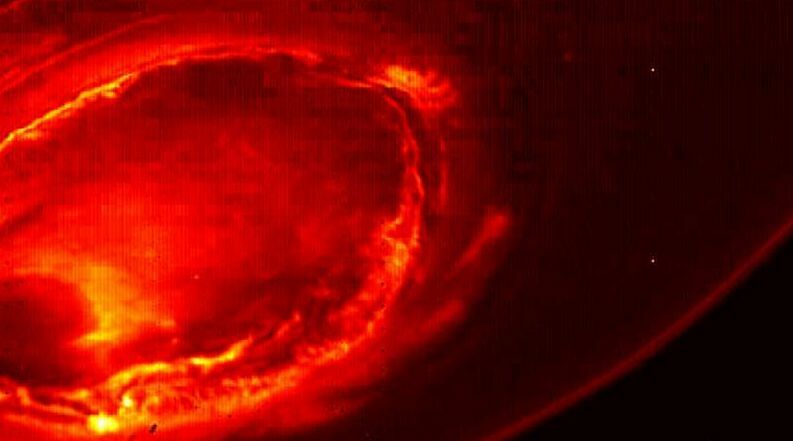 “JIRAM is getting under Jupiter’s skin, giving us our first infra-red close-ups of the planet,” said Alberto Adriani, JIRAM co-investigator from Istituto di Astrofisica e Planetologia Spaziali, Rome. “These views of Jupiter’s north and south poles are revealing warm and hot spots that have never been seen before. Juno doesn’t only have eyes, it has ears as well. We’ve known for a long time that Jupiter can be quite “vocal”, and the flyby allowed Juno’s Radio/Plasma Wave Experiment (WAVE) to capture the sound of the planet’s aurorae. Juno is now heading back away from Jupiter on the second of its “long” orbits of the planet. On October 19th, the spacecraft will once again skim over Jupiter’s cloud tops, where it will perform a further braking manoeuvre to reduce its orbital period around the planet to just 14 days. The end of August saw various media outlets a-buzz with news about Russian scientists having detected a “strong” radio signal from deep space, with muttering and speculations about aliens, despite cautionary notes from assorted space-related outlets and organisations. 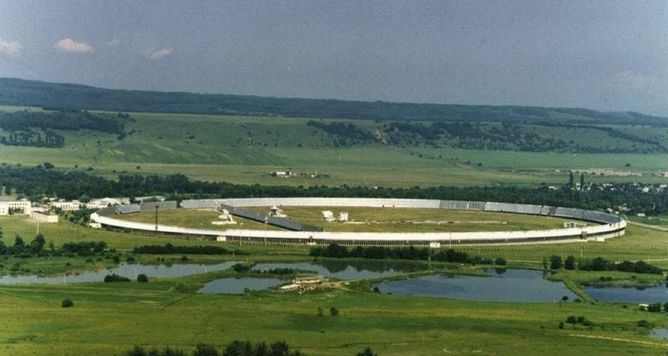 The signal was actually detected in May 2015 by the RATAN-600 radio telescope in Zelenchukskaya, south-western Russia. At the time, the telescope was conducting a survey of astronomical objects in the framework of the SETI (Search for Extraterrestrial Intelligence) programme. It seemed to come from the general direction of the star HD 164595, a star around 95 light years away which is very similar to our own Sun but about 1.5 billion years older, and known to have at least one planet – a gas giant roughly the mass of Neptune – orbiting it. News about it reached a wider audience in August when a member of the team behind the survey decided to e-mail data on it to colleagues asking for thoughts on what it might be, and suggesting the region of the sky containing HD 164595 should be monitored for further indications of the signal and possible causes. This request was picked up by science and technology writer Paul Gilster, who blogged about it on his website Centauri Dreams. While Gilster clearly stated there was no evidence of the signal being the work of an extra-terrestrial civilisation, he did couch his post in terms of the power requirements and possible technological status of such a civilisation were the signal to prove to be artificial in nature. The information was also received by the SETI Institute in California. Their senior astronomer, Seth Shostak, estimated that if transmitting in all directions, the signal would require energy on the order of 10^20 watts – or more energy than the Earth receives from the Sun – making the originating species a Type II civilisation on the Kardashev scale. If directed solely towards Earth, Shostak estimated the energy requirement would “only” be around 10^13 watts – roughly equivalent to all of the energy used by humanity here on Earth, putting the aliens at a Type I civilisation on the Kardashev scale – that is, equal to or slightly more advanced than we are.